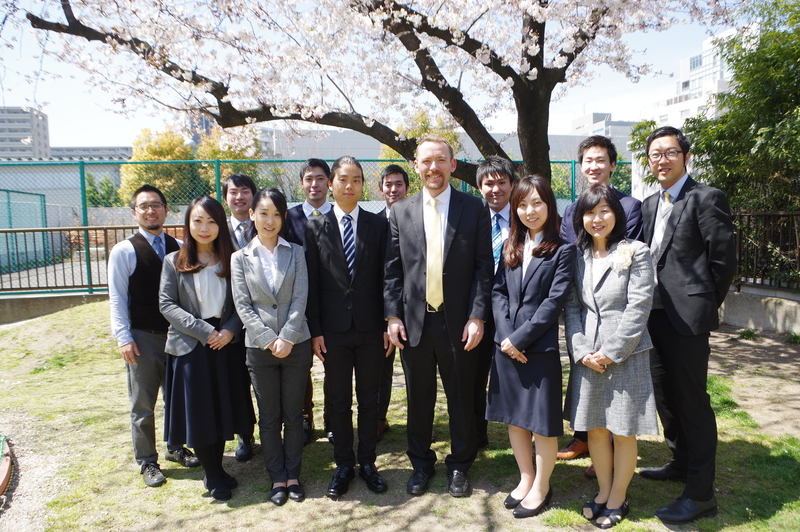 Caroline and I first came to Japan in the summer of 2008 to see if this is where God might be calling us to serve. After spending the summer here and teaching two courses at Christ Bible Seminary, we felt the Lord directing us to live and minister here. 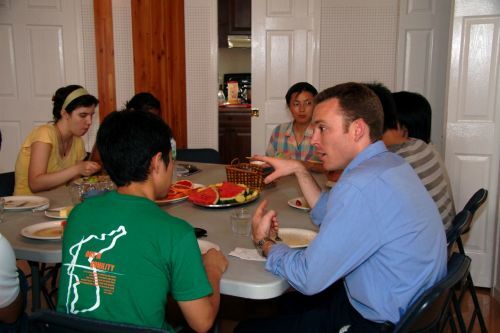 At the end of that summer I entered a PhD program in order to prepare for this ministry, and after returning to teach at CBS in the summers of 2010 and 2012, we were excited at the prospect of returning to live and serve here long-term. In November of 2012, the founder and first president of CBS, Michael Oh, asked if I would succeed him as president. At the time I was shocked that he was leaving, and perhaps even more so, that he was asking me to take his place. In God’s providence, that was just two months before we boarded a plane to Brisbane, Australia, where I was headed to serve as a one-year visiting lecturer at Queensland Theological College. I told Michael that I wanted to think and pray about this prospect, and when we arrived in Australia I asked my boss, Gary Millar, the principal of QTC, if I could shadow him during my time there. Gary kindly agreed, and so my time in Brisbane ended up being not simply a visiting teaching post but also an apprenticeship of sorts in which I was able to observe the ups and downs of leading a seminary community. During that year we ended up deciding that I would accept Michael’s offer to succeed him, though we were still several years away from moving to Nagoya. After returning from Australia I taught for two semesters at my alma mater, RTS, which I had agreed to do two years prior. We then went through MTW’s evaluation and assessment process and spent a year and a half raising support before moving to Japan in March 2016. Upon coming to Japan, we did not move directly to Nagoya but to a city called Okazaki, about an hour south of Nagoya. 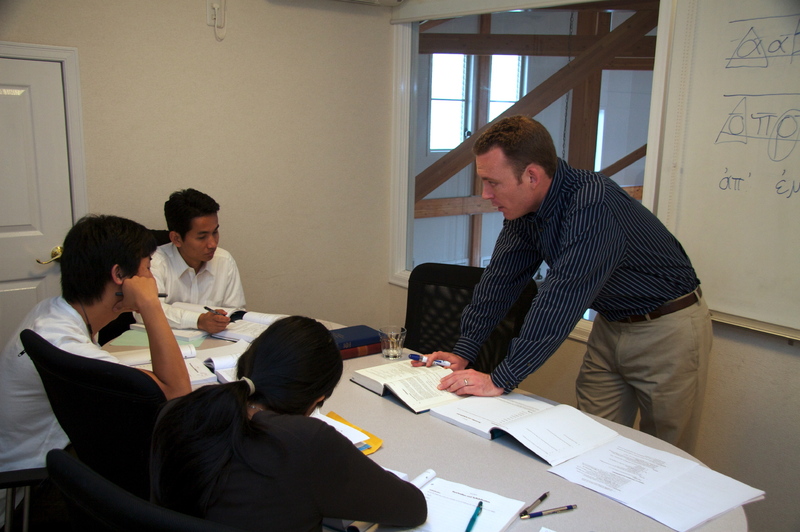 We came to Okazaki in order to focus our first two years on Japanese language acquisition. 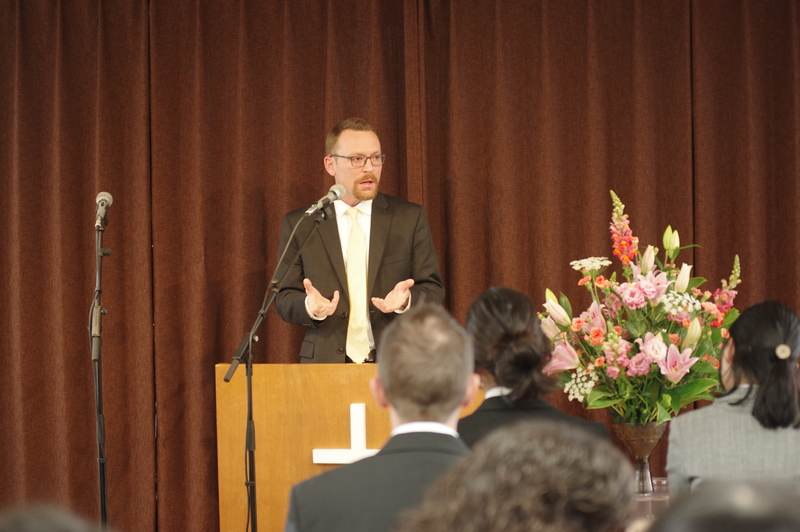 Then after two years of Japanese study we announced to the seminary community that I would assume the presidency during our convocation ceremony of 2019. 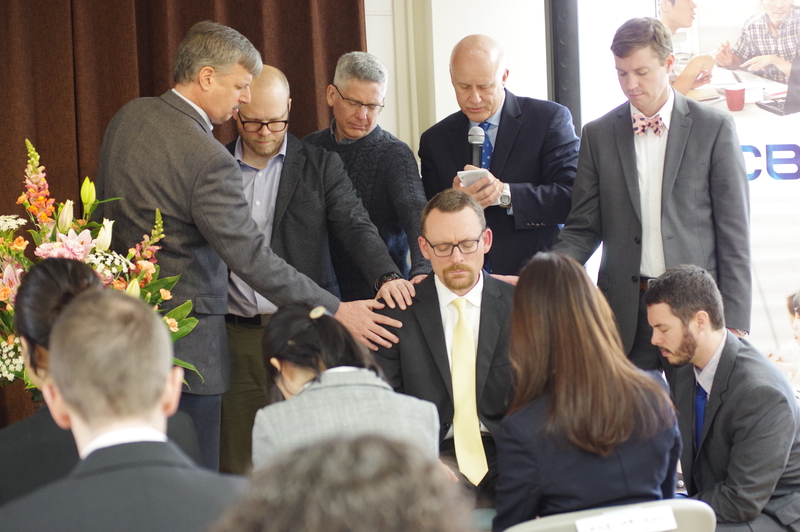 This past Friday, April 5, we experienced the culmination of these many years of preparation as I was installed as the second president of Christ Bible Seminary. For the past six years my colleague Craig Chapin has served as the interim president of CBS. 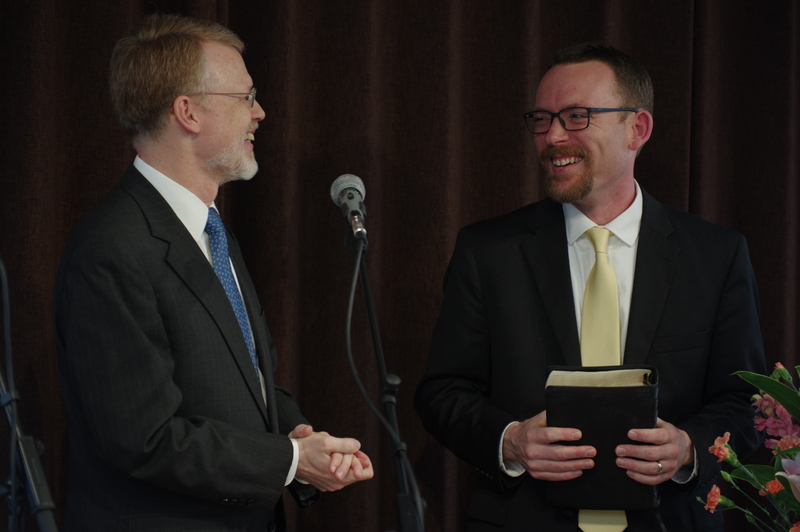 He has been invaluable for the seminary and a true friend to me as I’ve prepared to step into this role. Here he is presenting me with a Bible that our first president donated to the seminary. 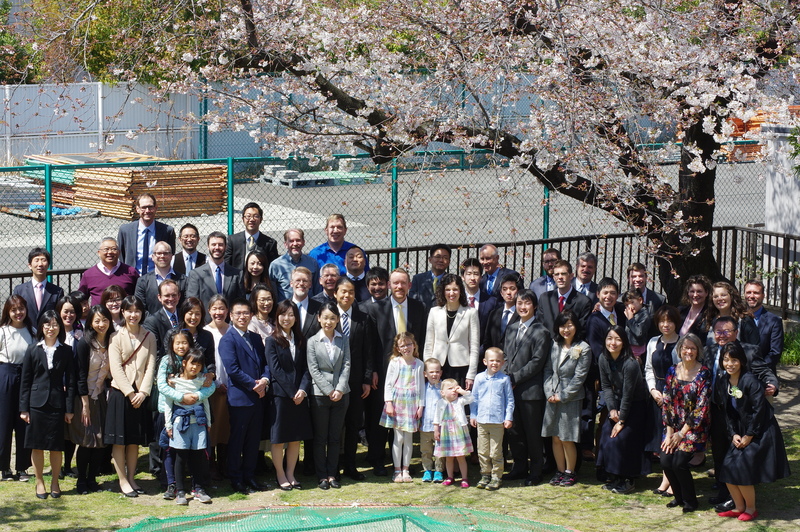 All the MTW team leaders from throughout Japan were kind enough to attend the installation ceremony and laid hands on me to commission me for this service. Here’s a group photo of everyone who attended. We were thankful to have past, present, and incoming students, faculty, staff, pastors and friends all in attendance. To God be the glory! Previous Post The Great Commission: Are We Actually Commanded to “Go”?